Congratulations to Sean Dunwoodie, Winner of Event 3: $1,100 Pot Limit Omaha (AUD$37,750)! 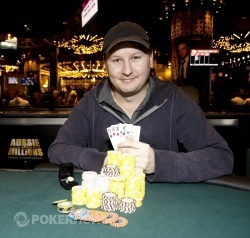 The 2011 Aussie Millions has crowned its third champion, with Sean Dunwoodie proving too good, taking down Event 3: $1,100 Pot Limit Omaha! It would be 151 players who contributed to the AUD$151,000 prizepool, most of which were simply making a donation, as play dwindled to the sixteen who would take home some cash. The event attracted some of the best players Australia has to offer including Grant Levy, Billy Argyros and Tyron Krost, while the worldwide poker contingent was headed by James Akenhead, Barny Boatman, Richard Ashby and reigning champion Annette Obrestad. Unfortunately none of the aforementioned names could survive to see past day one, sent packing with the 135 others who took home no more then a bad beat story and a thinner wallet. Making the cash, but falling shy of a final table berth included Ali Aksoy (16th), Tim Marsters (15th), Jenny Son (14th), Anton Wigg (13th), Mag Algassim (12th), Mark Segal (11th) and Vince Moro (10th). Although the first to be sent home, Antoine Bechara is still the man of the moment. Bechara has had an astonishing run at the Aussie Millions so far, final tabling both event 1 and event 3, his 9th place finish here adding to his growing resume. 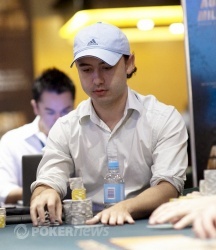 With only nine spots at the final table, it would be Haibo Chu who would go in as the chip leader, with Australian Poker Hall of Famer Mel Judah sitting to his left as one of the shorter stacks. Judah would out survive the big stack by one though when Chu was eliminated in 8th place. 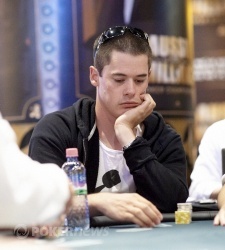 Michael Guttman would be the next to fall by the wayside, sent home in 6th place, leaving five players to fight it out. The next two eliminations would come in quick succession, so quick that they would have to share the same bad-beat story as Harry Demetriou delivered a double-knockout punch! Although sent to the rail in the same hand it would be Aarno Kivelio who would go into the record books as the 5th place finisher, while Joel Gaffney would take the title of 4th place. Matthew Konnecke would be the next to go, his third place coming only moments after the fourth and fifth. Konnecke’s finish would be good for $21,530, a consolation prize for having to watch the heads-up battle from the rail! The announcer would let the gallery in the Poker Room know that it would be Harry Demetriou going into heads-up action with a slight chip lead over his opponent, Sean Dunwoodie. As had become a custom at this final table, the knockouts would continue to fly fast, with Harry Demetriou falling to the might of Sean Dunwoodie in under 10 minutes of play. Demetriou leaves with a hefty $28,690 for his runner-up finish and a memory of taking part in one of the quickest final tables we here at PokerNews have ever witnessed! Congratulations to Australia’s Sean Dunwoodie, who now adds an Aussie Millions title to his growing list of achievements. The win sees Dunwoodie take $37,750 for his fearless play from the last couple of days. Be sure to keep your eyes on the PokerNews Live Reporting Team as they bring you continuing action of Event 4: $1,650 No Limit Hold'em Shootout, with play currently down to the last two tables and another Aussie Millions champion to be crowned! Harry Demetriou Eliminated in 2nd Place (AUD$28,690); Sean Dunwoodie Wins! A few small pots and even fewer flops eventuated between Sean Dunwoodie and Harry Demetriou before the big final hand - and we mean BIG - played out between the heads-up combatants. Dunwoodie raised before the flop and Demetriou called before leading out for 96,000 on the flop of . Dunwoodie flat-called, the dealer produced the on the turn and Demetriou checked to Dunwoodie who fired out a bet worth 250,000. "How much is it to raise the pot?" Demetriou asked the dealer. The dealer raked in the 250,000 from each player, then began to count. "250 ... plus 288 ... one-point-one ..."
"Stop right there," Demetriou said. "I'm going all in." Demetriou then promptly shoved his last 290,000 into the middle. Dunwoodie didn't waste any time, snap-calling before tabling for two pair. Demetriou showed for a straight draw, but to no avail - Dunwoodie sealed the deal when the bricked out on the river. Ladies and gentlemen, we have a winner - congratulations to Sean Dunwoodie, the 2011 Aussie Millions $1,100 Pot Limit Omaha champion! It's now time for the Padawan of the PokerNews team, procession, to wrap this one up. Heads up play is about to commence. This is how the chips look going into the battle. Matthew Konnecke was down to barely a couple of big blind when he was waiting out for the hand which would be his saviour. When he finally succumbed to the enevitable allin cry the two remaining players made the call. Konnecke sat dorment, holding his cards as the action played out with Sean Dunwoodie and Harry Demetriou playing out the hand. Dunwoodie and Demetriou checked down the hand and Demetriou would show his hand first. Demetriou holding a , with the seven in the window of the flop enough for his two opponents to muck their hands, Demetriou taking down the pot and sending Konnecke home in 3rd place. Put a fork in Aarno Kivelio and Joel Gaffney because ladies and gentlemen they are both done and dusted in 5th and 4th place respectively, after a double-knockout has left us with just three players. Kivelio bet pot from the button, Harry Demetriou calling from the small blind and Gaffney moving allin from the big blind. With action now on Kivelio he to would be allin, Gaffney having him covered. Play came back to Demetriou, with his monster stack towering over the two short-stacks. Demetriou made the call, cruely putting two tournament lives at risk. The board ran out , the devestating jack on the turn being the end of the tournament for Kivelio and Gaffney. Kivelio is sent home in a respectable fifth place earning AUD $11,325, while Gaffney goes home in a gallant fourth place receiving AUD $15,855. Despite having doubled up through Matthew Konnecke moments earlier, Michael Guttman has just been cast out in sixth place by Harry Demetriou. 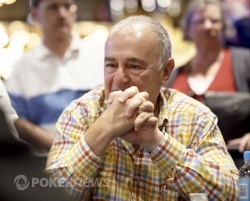 Michael Guttman raised to 40,000 from under the gun and the action folded to Sean Dunwoodie who flat-called from the button, as did Demetriou to make it three-handed to a flop of . Demetriou led out for 120,000, Guttman shoved, Dunwoodie folded and Demetriou snap-called. Despite having hit a set of sixes with the nut flush draw, Guttman had caught his straight, but would need to dodge the spades as Demetriou still had the nut flush draw. The turn of the was the right colour, wrong suit, as was the , but it was still golden for Demetriou as it gave him a full house! 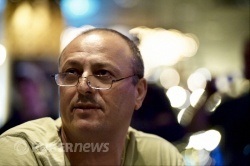 Guttman picks up $8,155 for a hard day's night, while Demetriou moves back up to almost 300,000 in chips. From this point onwards, the five remaining players are now guaranteed a five-figure payday! Michael Guttman has moved out of the short stack position for the first time at this final table, doubling through Matthew Konnecke. Konnecke potted it from the small blind and the action folded around to Guttman who shoved from the small blind. Konnecke called and showed down but needed a lot of help against the of Guttman. There was no help for Konnecke on the board of ; Konnecke is down to just 95,000 while Guttman moves up to 220,000 in chips. With play back from the break we thought it time to see how our final six stand in terms of chip counts!